NASA Mars Discovery Misunderstanding: Mission leader excited about entire mission, not specific discovery. 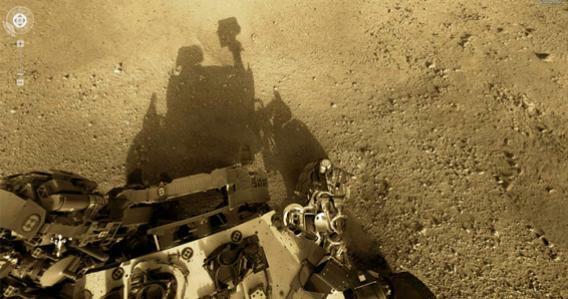 Self portrait of NASA’s Mars rover Curiosity, which arrived at the Red Planet on Aug. 6, 2012. Remember last week when we told you about how NASA’s Curiosity rover had reportedly sent back some very interesting data from Mars in the form of a soil sample that could be, in the apparent words of one of the mission’s leaders, “one for the history books”? Yeah, well, now NASA is saying that all the hype is actually just a giant misunderstanding between the scientist and the NPR reporter who interviewed him—a mistake that was then multiplied many times over by each news outlet (again, including us) who picked up the story. The quote heard around the world came shortly after [scientist John] Grotzinger explained that NASA had just received the initial data from Curiosity’s first soil experiment using a new Sample Analysis at Mars (SAM) instrument, which is capable of identifying organic compounds. So to recap, Grotzinger was apparently trying to express just how excited he was about the entire mission, not about any one specific discovery; it is the sum of all of Curiosity’s past and future discoveries that he thinks will be historic. His particular choice of words—“This data is gonna be one for the history books”—however, along with the suggestion that his team was currently double- and triple-checking data it had received (something that is standard procedure) gave NPR the mistaken impression that there was something specific that NASA was eager to celebrate as a major discovery. Grotzinger says they recently put a soil sample in SAM, and the analysis shows something remarkable. “This data is gonna be one for the history books. It’s looking really good,” he says. Grotzinger can see the pained look on my face as I wait, hoping he’ll tell me what the heck he’s found, but he’s not providing any more information. While it’s a little odd that NASA’s communication team didn’t manage to quickly quash the rumor after the original report aired, Veronica McGregor, NASA’s news and social media manager for the Jet Propulsion Laboratory, told The Slatest late Tuesday night that they did their best to set the story straight. The day after the story first aired, the team used Curiosity’s official Twitter account to tweet: “What did I discover on Mars? That rumors spread fast online. My team considers this whole mission ‘one for the history books’.” That message, however, was largely lost in cyberspace over the long holiday weekend, possibly in small part because the account often strikes a somewhat whimsical tone. But McGregor told us that NASA was also sure to pass along the correct info to any media outlet that inquired about the quote in question. A version of this post was first published on Tuesday at 6:01 p.m.